Infinite Art Tournament: The Infinite Art Tournament, Round One: Ghiberti v. Ghirlandaio! 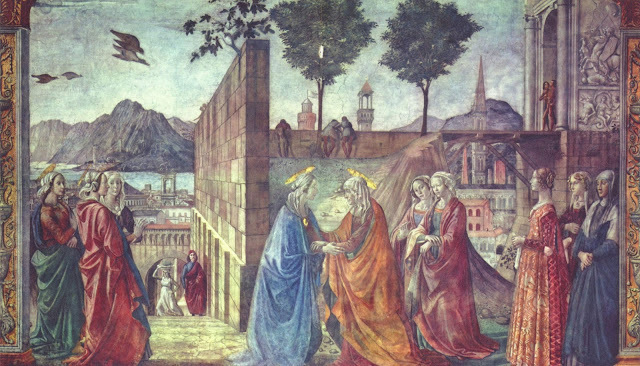 The Infinite Art Tournament, Round One: Ghiberti v. Ghirlandaio! Ghiberti for me. I sort of got into bas-reliefs at the Louvre recently, plus the second one reminds me of Captain Kangaroo. * I'm feeling nostalgic. I thought that Ghiberti #2 was Chairman Mao as well. He gets my vote! Ghiberti, not Mao. Some googling leads me to vote Ghirlandaio. Oh, you've got to love those Florentines. Ghirlandaio has my vote--I love his portraits, and then he also excelled at the big fresco cycles with the new yummy perspective...building on the work of men like Ghiberti, I must concede. Vote by email: "Has there ever been one when two artists from the same -- not country, city -- overlapped? Both stars -- what a place. Ghirlandaio was six when Ghiberti died! I'm voting for Ghirlandaio." I have to say, I'm very very torn here. Ooh, Ghirlandaio is pretty sweet! 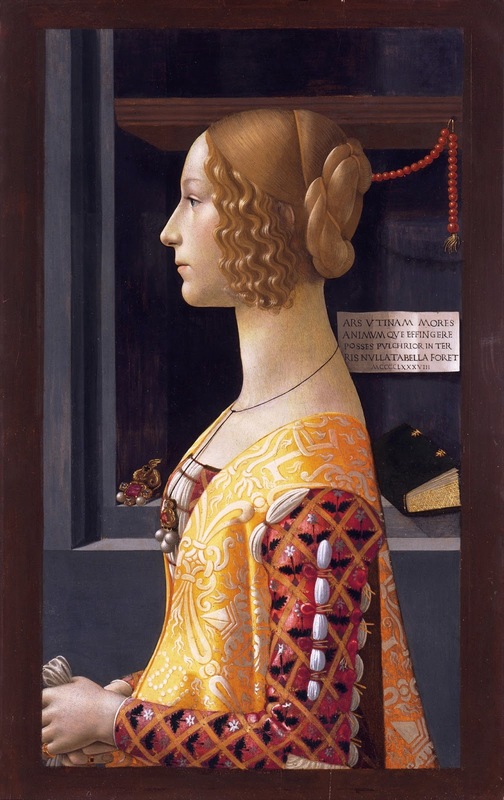 I'm not sure why the Florentine woman has beads coming out of the back of her head, and I'm not sure why the jewelry on her chest is echoed by the one on the shelf, though there's probably some good reason, but I do admire her sleeves. On the other hand, I do love me some good relief work, and the Ghiberti David and Goliath bit here even has guys with tights that are a bit baggy where they got stretched out from sitting down(I think), and lovely perspective and sense of depth, and that tree in the foreground and the handy vein of rocks right by David's slingshot, and SAVL and IERVSALEM, of course. (I like it when artists label things.) In other words, I'm voting for Ghiberti. Heavens, it's 5-5 and I still don't have enough of a druthers to make things simple with a tiebreak vote. I guess the boys from Florence will have to try their luck in a First Round Tiebreak!